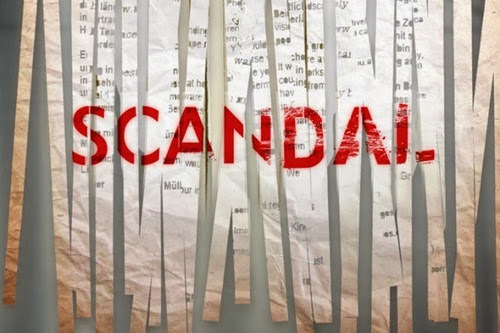 So, Thursday night was the so-called mid-season finale of Scandal. I must say I was a bit disappointed. On the other hand, I’m thrilled that I feel like I will be able to survive until the next episode without freaking out too much! To be honest, the Grey’s Anatomy mid-season finale left me wanting more, while Scandal made me feel a little bit let down. Let’s look at the various plot lines shown for the episode 310, “A Door Marked Exit.” If you haven’t seen the episode yet, come back when you have! Moving on to this sad duo…James immediately figured out that there was some connection between his sleeping with Daniel Douglas and the guy’s death. David Rosen refused to help him, but now that he’s been given a bit more info on the situation, I imagine David and James will be working together again soon. As for James and Cyrus, if Cyrus makes James the White House Press Secretary, James won’t leave him. 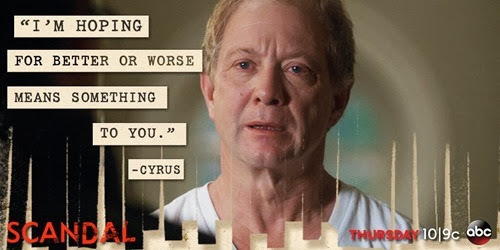 I guess Cyrus has the power to make that happen. And yet, Cyrus doesn’t want it to come out that Sally killed her husband, which James would have to report on if that information leaks. I expect Cyrus will find new ways to manipulate James in the coming episodes. Last week Sally told Fitz she was leaving the ticket to run as an independent. Mellie used her knowledge of Sally’s sin to reinforce that Sally cannot now run for president. However, I think Fitz’s team is going to want Sally off the ticket very soon! Quinn leaves Charlie sleeping in bed to return to Olivia Pope and Associates. She marches past Harrison and Abby and heads straight in to see Huck. Huck refuses to apologize and instead tells her she’s off the team. 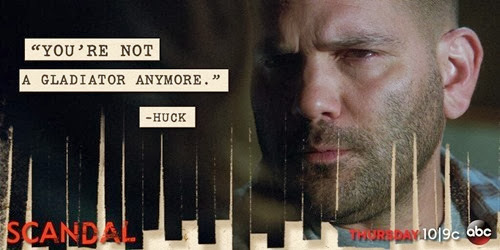 Is Huck the boss now? I don’t think Olivia will like this decision. Especially since Quinn headed straight back to Charlie. Quinn’s character is totally up in the air right now as to what will happen and where her loyalties will push her. Fitz sits down in the Pentagon with Rowan and tries to find out exactly why Eli imprisoned his wife for 22 years. At this point, Fitz still thinks Maya Pope was innocent. Rowan won’t answer anything, even when Fitz asks him what kind of father takes away his daughter’s mother. Even when Fitz tries to rile him up by talking about the things he does with Olivia. This does cause Rowan to snap and he delivers the best part of the episode, attacking Fitz for being a spoiled rich boy who only loves Olivia for being his “door marked exit” from the presidency and from living up to his own father’s expectations. Watching Fitz and Olivia together, I never got the feeling that race was an issue for them. While I guess not race exactly, class is obviously an issue for Rowan, as he compares how hard he had to work to get as far as he did and how Fitz got everything just by being a Grant. Fitz just looks on while Rowan rants; meanwhile, he takes Rowan’s job out from under him and replaces him with Jake. So Jake is the new head of B613. And Fitz put him there. I think this is Fitz’s way of gaining control over B613 and over Jake. I honestly don’t know where this plot point will go from here though. Jake said goodbye to Olivia and started his new position at Command. Now what? 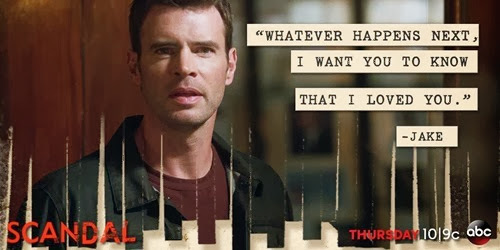 And no, I don’t believe Jake loves Olivia. I mean he liked her a lot. But he barely knows her really. All they really had in common was a mutual hatred for her father. One thing I don’t understand is how Fitz and Jake were both on the same operation – isn’t Fitz like 10-15 years older than Jake, at least? This plot line was the most interesting for me. What is her deal? I have no idea. After talking with her father, Olivia comes to understand that her mother tricked her father into thinking there was a bomb on the plane that he had shot down. Olivia wants her mother captured once she gets to Hong Kong – but she never gets there. When I watched the scene in which we are shown what happened to the plane, I thought Maya Pope was dead. Apparently she was just “in the wind.” Or standing outside the White House, looking like a fancy, older version of Olivia, and threatening her imminent return. Um, what? What will Olivia do with that information? 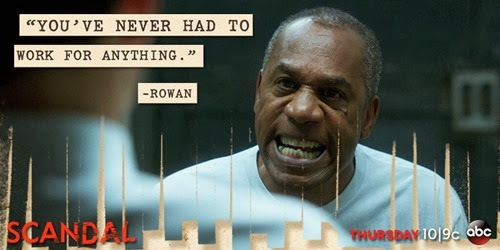 Will the rest of the season focus on finding Mama Pope and arresting her once again? Is she dangerous and is she coming after Olivia? I guess we’ll find out – maybe!